Here is the status of harbor projects and issues as the new year begins. The Fisherman’s Wharf developer and Ventura County continue to fail to provide the information needed by the City of Oxnard to process the County’s application for a Local Coastal Plan Amendment (LCPA). Without this information, the City cannot perform a reasonable and public review of the project. In October 2017, the County was directed by the Coastal Commission to obtain an LCPA from the City. The County met again in November 2018 with the City and the Coastal Commission. We hope the County will now submit the required information any LCPA applicant must provide to the City. If the County chooses not to do so, will it drop the project? Or will it continue to try to circumvent the City’s jurisdiction and ignore the Coastal Commission’s October 2017 directive? Refusal to deliver the required information, and issue only threats of litigation, reinforces suspicions about the legitimacy of the County’s proposed 400-unit apartment project. December 1,2015 – The Fisherman’s Wharf Developer entered into a maximum 5-year lease option with the County. This lease option required that the Developer (CIHP) obtain entitlements from the City of Oxnard to proceed with their proposed development (400-unit apartment project). 2016 and 2017 – CIHP, the developer and County tried bypassing the City’s authority. This is apparent by the nine written rejections from the Coastal Commission staff and the October 12, 2017 Coastal Commission (CCC) hearing that resulted in the CCC directive to apply for a Local Coastal Plan Amendment with the City of Oxnard. Present – The County and Developer (CIHP) have failed to complete their application to the City or pay their application fees as would be required by any other developer. The Developer now has another 11 months to fail to follow the process if they so choose or they can follow the standard required process – submit a complete application and pay their fees. If the Developer chooses not to do so, the County Board of Supervisors should be held responsible for their lack of business sense and ethics. If the public wonders why Fisherman’s Wharf has been allowed to deteriorate for so many years, the County’s decisions clearly demonstrate bad business practices by our County representatives and executives. The public has supported the hotel replacement project since it was proposed in March 2016. But County actions have continued to hold up the building of the hotel and it appears the project start will be delayed for at least another year or so. Here is an overview of the major delays. First, the County granted Channel Islands Properties LLC (CIHP), the Fisherman’s Wharf apartment developer, an Exclusive Right to Negotiate (ERN) for the exact same land site as Brighton Management (the hotel developer for the proposed Hyatt Place Hotel). This ERN was used to pressure Brighton to allow space for CIHP’s “undetermined development project” on the same land parcels originally approved solely for the hotel. The County also did this to get the height variance granted to the hotel builders for the hotel for their anticipated apartment developer’s project on the Peninsula. The County is also using this “height variance” as precedent for the Fisherman’s Wharf 400 apartment complex. Second, the approved “hotel project design” requires the City to give up land for the hotel to meet its parking requirements and allow land space in the future for CIHP to build its “undetermined development project”. The City supports the hotel project but without the County submitting an application for a “street vacation permit” (permit to use City land for hotel parking), the City is again unable to process their request for use of City land. If the County or developer does not apply for this permit, there will be another delay because Brighton will be forced to redesign its hotel plan in an attempt to accommodate and allow space for the apartment developer’s (CIHP) “undetermined project”. Parking is and will continue to be a problem on Peninsula Road with over 400 apartments, hundreds of condos and a popular community park competing for limited parking spaces. Third, in December, the Harbor Department found more rock revetment repair at the hotel site was required than originally estimated by the County. The Harbor Department has had almost 3 years to identify this problem. This is inexcusable incompetence or a deliberate delay tactic. We are told this could be an additional 6-month repair job. However, before repairs can even take place, the old Casa Sirena Hotel must be removed so the repair work can be done from landside according to the Harbor Director. This means Brighton would need to demolish the hotel first and then the revetment repair could start. Demolition requires a City permit. It now appears the hotel project will be delayed for at least another year or more (hotel replacement project was approved in March 2016). This again reveals the hypocrisy in the County’s rhetoric on the urgent need for harbor revitalization. The cause of the change in harbor water quality, including the shutting down of the power plant, is being scientifically investigated. Grants to subsidize the cost of restoring and maintaining water quality can be pursued once the study is completed and the causes identified. It is apparent that at this time, the option of turning the power plant pumps back on is not viable. Furthermore, NRG Energy has pulled its 2015 application to build the Puente Power Project in the Mandalay Generating Station. This makes any cooperation from NRG unlikely. The City is currently considering its legal options regarding the removal of the power plant. Perhaps a water quality solution could be incorporated in the City’s plan. In the meantime, the County has refused to assist in this harbor-wide concern. Instead, the County is leaving the responsibility and cost to the City. The City has installed several aerators within the harbor to help with water circulation but this is not a long- term solution to maintain water quality. Global warming and climate change will also impact the harbor over time. It has been nearly two years since the original announcement that Fresca II would be opening at the deteriorating Whale’s Tail restaurant building. Finally, the Harbor Department has confirmed they’ve agreed upon lease terms. The terms will be submitted to the Board of Supervisors in January or February 2019 at the latest. The terms should be publicly available at that time. However, the Harbor Department was either unwilling or unable to identify the key factors on which their selection of Fresca II was based. It is especially important for the public to understand how decisions are made in selecting a lessee for a specific harbor facility or service. In the future, such factors should be made public at the time the County is requesting proposals, not after the selection has been made, and all proposals should be made public. This would be true transparency. The article claims that Huntington Harbor is the last harbor to establish a formal Harbor Commission to oversee everyday issues affecting boaters and other users of the harbor. The article, though incorrect in this fact, goes on to explain the importance of having a harbor commission. With so many ocean and environment issues like rising sea levels, water quality, recreational safety, general infrastructure and facilities, environmental justice, codes, etc., Orange County recognized there was a need for a commission. A commission can gather information, involve stakeholders, help analyze issues from diverse perspectives, and contribute to the development of a long-term harbor plan. Channel Islands Harbor should also establish a Harbor Commission of elected stakeholders, and then in reality would be the last harbor to establish a Harbor Commission. The following is a brief timeline of events related to proposed development in Channel Islands Harbor between October 2017 and August 2018. The Coastal Commission determined the County must obtain a Local Coastal Plan Amendment (LCPA) from the City of Oxnard. HBCA attended the Coastal Commission hearing and supported the City of Oxnard. We won by revealing the County’s many contradictory positions as well as supporting the City’s jurisdiction over its Local Coastal Plan. To date, the County and developer have not submitted the documents necessary for the City to responsibly review and process the project’s amendment application. Their application to the City remains incomplete as of this date. The Board of Supervisors awarded 2-year extensions of Exclusive Right to Negotiate (ERN) to the developer, Channel Islands Properties LLC, for three premium waterfront properties: Fisherman’s Wharf parcels on Victoria Avenue until the end of 2022, and the exact same parcels as the hotel replacement project on Peninsula and the promontory lot on Harbor Boulevard across from the Harbor Walk Complex until June 2020. These valuable extensions were given to the developer at no cost. HBCA spoke at the Board of Supervisor’s Meeting, wrote letters to the Supervisors and wrote a letter to the editor published in the Ventura Star describing the action as a “strange move” that made no business sense. The County gave power of attorney to the developer, Tom Tellefson, to negotiate with the City on behalf of the County for a Local Coastal Plan Amendment. Our land use attorneys said this was an extraordinary action, one they had never seen before and it was an obvious conflict of interest. Initially, the County denied they gave this authority but official documents prove otherwise. HBCA then wrote articles in several media outlets publicizing the questionable business sense of this clear conflict of interest. Note: this was done just a few days before Lyn Krieger announced her retirement. The County and developer submitted within their Local Coastal Plan Amendment (LCPA) a request for changes to the City’s HCI Sub-Zone Sections 17-24 eliminating bait and tackle shops, boat sales, yacht clubs and clubhouses from permitted uses at the harbor. These changes might have gone unnoticed in such a large document without HBCA’s vigilance. It was so incredible most people could not believe it because it was so contrary to the fundamental purpose of a harbor. HBCA notified the public of the County’s action. On May 26, 2018, when questioned by the yacht clubs, Lyn Krieger defended this action by saying it was only for the Fisherman’s Wharf area. HBCA pointed out that other changes requested to the HCI Sections 17-24, specifically noted they were only for Fisherman’s Wharf. However, the County did not limit the elimination of yacht clubs and other harbor services to only Fisherman’s Wharf. On July 10, 2018, after continued questioning from HBCA and the yacht clubs at a meeting with the Channel Islands Harbor Lessees Association, the County said the elimination of yacht clubs and other harbor related services as a permitted use at the harbor was really a “mistake and unintended”. Note: to date (9/5/2018) the County has not rescinded this officially in writing. HBCA organized a Specific Planning Charrette led by a professional facilitator and attended by a cross section of 31 major local organizations. The goal was to identify a set of alternative development criteria for the 400 apartment project at Fisherman’s Wharf. A key finding identified the need for an updated Public Works Plan (PWP) and a comprehensive Master Plan for the entire harbor. On February 8, 2018, the Charrette findings were presented to the City of Oxnard at a Special Harbor Task Force by the Charrette participants. Close to 300 members of the public attended. Lyn Krieger announced she was retiring at the end of March 2018. On February 6, 2018, the Board of Supervisors voted to allow Lyn Krieger to stay on as a part-time employee to oversee the unpopular Fisherman’s Wharf project by making her an exception to the Pension Reform Law (PETRA 2013) which only allows exceptions for “critically needed” positions for an emergency situation. Prior to this Board meeting, HBCA sent a pointed letter objecting to this action. HBCA went to the meeting but the Board had moved the item to hours earlier than scheduled to avoid public comments. HBCA then wrote an Op Ed published in the Ventura Reporter, calling the Board’s action a “strange move” and another bad business decision. The County attempted to rename and reconfigure the land parcels designated for the Casa Sirena Hotel replacement project. This would give the developer of the Fisherman’s Wharf apartments a possible future project. In reviewing the County’s Notice of Impending Development (NOID) for the hotel, HBCA uncovered these changes and questioned the legality of such changes with the Coastal Commission staff. The Coastal Commission told HBCA they had also noticed the changes and had notified the County that such changes would require a Public Works Plan amendment. This was important to ensure all future harbor land parcel changes go through the required public process. At the Board of Supervisors meeting, the Harbor Department presented a report on the “Harbor’s Economic Impact on Ventura County”. HBCA raised a concern that this report should have been provided to the public prior to the meeting. The public has a right to review all documents prior to a meeting in order to prepare comments if needed. This was a violation of the Brown Act and HBCA has written to the District Attorney to censure the Board of Supervisors for this action. The District Attorney is now investigating this matter. The County, in Lyn Krieger’s letter of July 20th to the City of Oxnard demonstrates the County’s intractability. It repeats the request that the City’s Local Coastal Plan (LCP) be made to conform to its General Plan. This is contrary to coastal law. In the Coastal Zone, the LCP governs, not the General Plan, so if anything, the General Plan should be made to conform to the LCP. The County also asked that the City process the LCP amendment within 90 days. The City of Oxnard responds to the County’s letter of July 20th. In the letter, the City respectfully disagreed with certain characterizations identified in Krieger’s letter regarding “events that occurred, documents and information that have been provided, and the assurances and reassurances that were made.” The City’s letter also said that the City had in cooperation and good faith, streamlined the process for the Developer and was unable to accept requests for further concessions in the LCP process. The City also asserted its right and responsibility to identify and consider the environmental impact of the project, given its proposed size and scope. It also stated it could not guarantee that it could conduct and complete its review within 90 days from the Developer’s submittal of a complete application. Note the Developer has not filed a complete application to date. HBCA met with the new Harbor Director, Mark Sandoval. Mr. Sandoval said he would not change any projects that are as far along as Fisherman’s Wharf. He said, “the project is Lyn Krieger’s project”. Going forward, we would like to see a “change” to an open, transparent RFP (Request for Proposal) process at the harbor with open bidding for development that is not limited to apartment developers’ proposals. In addition, when the existing ERNs expire in a year and a half, an open rebidding process should be implemented. Note: in the meeting Mr. Sandoval assured us that when the time comes for a rebidding process, it would be an open one. HBCA said we believe in actions not rhetoric so we will observe his actions as the new Harbor Director and see what he does. The County continues to insist that the the City simply rubber stamp the plan to replace the largest open space public, boater and visitor serving land in the harbor with a 4 story 400 unit apartment complex. Join your friends and neighbors who understand how lucky we are to have such a beautiful harbor and realize the importance in opposing the Fisherman’s Wharf 400 apartment project. Our harbor is one of the most beautiful small boat harbors in the nation. 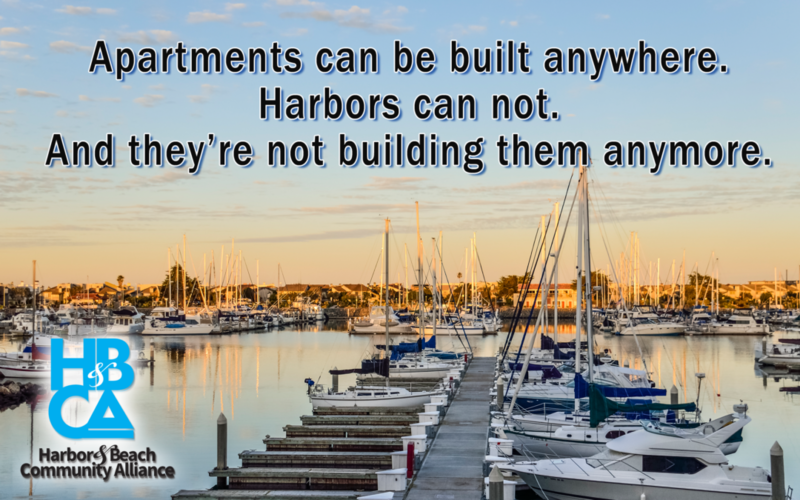 There are only 12 small boat harbors along the 1,100 miles of California coastline and harbors are not being built anymore. 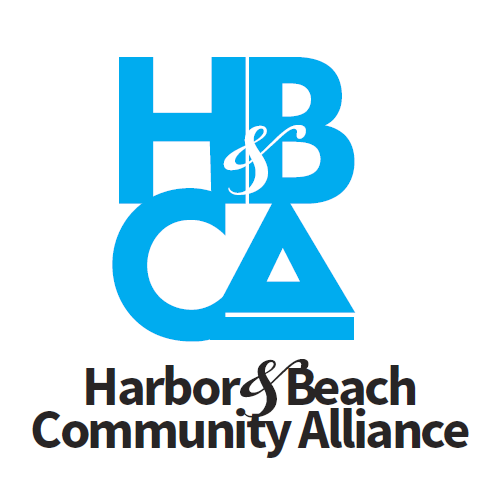 The Harbor & Beach Community Alliance (HBCA) is different from other community groups because HBCA is guided by experts and legal counsel. This strategic guidance has made HBCA effective. To date HBCA has succeeded in delaying this project, forcing it to go through the normal regulatory process. But it is not over. To continue to be effective, expert and legal advice is essential and that requires funds.